Denny Hamlin finished 11th in Sunday’s NASCAR Sprint Cup Series race at Michigan International Speedway, battling track position throughout the 201-lap event on the two-mile track won by Greg Biffle. Hamlin restarted 10th for the two-lap ‘green-white-checkered’ finish but was unable to make up any ground, settling for a hard-fought 11th-place run in the season’s 23rd race. 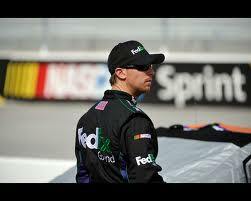 Hamlin started 21st in the #11 FedEx Office Toyota and quickly moved up into the top-15 in the early going. A caution near the race’s midpoint saw Hamlin sustain minimal right-front damage. He came to the pits for repairs, but had to restart back in 28th. A caution shortly after allowed Hamlin to move up as the leaders pit, and a long green-flag run shuffle the #11 car to the lead for a lap prior to the race’s final caution period. The finish kept Hamlin 10th in the NASCAR standings following Michigan, 96 points behind leader Biffle after 23 of 26 regular season races. The Series heads back to Bristol (Tenn.) Motor Speedway for Saturday night’s 500-lap event at the ‘Concrete Coliseum.’ Hamlin is making his 14th career start at the half-mile track, recording six top-10 finishes in 13 career Bristol races, including a runner-up result in the Spring 2009 event. In the March race at Bristol earlier this year, Hamlin finished 20th, fighting track position in the #11 FedEx Ground Toyota Camry throughout the 500-lap event won by Brad Keselowski. A right-front wheel left loose during a key green flag pit stop near the race’s halfway point forced a second stop, where the #11 Toyota lost two laps to the leaders. Hamlin and crew chief Darian Grubb did all they could to work strategy for the remainder of the race, but eventually settled for 20th. The FedEx Ground Western Rockies district will be recognized for outstanding safety performance with its district code “WROK” on the b-post of the #11 FedEx Ground Toyota this weekend at Bristol Motor Speedway. The Western Rockies district extends from its Salt Lake City hub to include most of Idaho, Nevada and Utah. Do you think Bristol owes you a victory after coming so close in the past?